Kundayi Masanzu’s Mail and Guardian opinion piece “Academics lose out to online study” raises a crucial question as lecturers prepare to move their modules online: “Moocs have opened up the floodgates of knowledge dissemination and, at the same time, exposed the importance of clarifying knowledge ownership within tertiary institutions.” What is the fairest balance between the sharing of learning content, and commercial publication? Prof Caroline Ncube of UCT provides a helpful response to the question. In June I participated in a workshop at MIT called “A Flipped Workshop: Hands-on MOOC Development”. Participants worked in teams of five and were given a “course packet” to develop their MOOC module. Our group were allocated the “Stanford Prison Experiment” – a chilling case study in research ethics abuse. Other groups worked on the course packets “Creative Commons” and “Economics”. Facilitators supported each team. Leading the workshop was Professor Isaac (Ike) Chuang, who has played a leading role in the development of the MIT-Harvard edX MOOCs initiative. 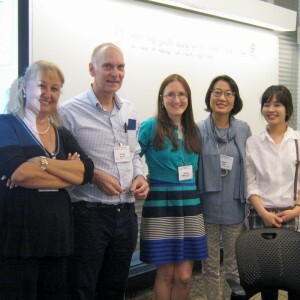 Our group (see photo) comprised Dr Hayal Koksal (Turkey), myself, Prof Okhwa Lee (South Korea), Melody Nelson-Lyon (Canada) and Jules Seo (South Korea). The MIT TEAL laboratory (Technology Enhanced Active Learning) provides small group computer clusters in a circular table layout, each fitted with a conventional whiteboard, wall screen and a ceiling mounted video camera trained on the whiteboard area. Each setting is therefore a purpose-built flipped-classroom delivery system, allowing the participant to assemble pre-constructed elements of the virtual classroom, and seamlessly integrate these with live recordings of lecturer, demonstrating specific details of the lesson on the whiteboard. The lab is brightly-lit, comfortable and well-equipped, and located near the Vannevar Bush building and the Wright Brothers Wind Tunnel. There is a tangible sense that you are near one of the world’s most dynamic engineering and technology hotspots. 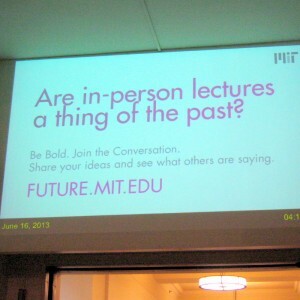 On the way to the lab, I passed under a video announcement board suspended above MIT’s “infinite corridor” that proclaimed: “Are in-person lectures a thing of the past?” (see photo). The MOOCs that radiate from the edX platform are global experiments in testing that very question. 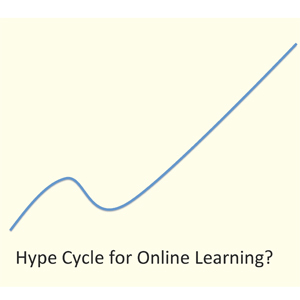 At a recent conference on MOOCs, (Massive Open Online Courses) held at MIT in the US, one of the keynote speakers, the eminent educationalist , e-learning quality expert and one-time VC of the Open University in the UK, Sir John Daniel, showed a graph entitled “Hype Cycle for Online Learning?” depicting a steep rise in the curve over the last year. Of course the key to the point he was making is in the word “hype”. 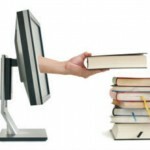 The recent frenzy over MOOCs, he pointed out, ignored the excellent development work in e-learning over the last 15 years. He argued forcefully that the valuable findings of e-learning developers and practitioners should not be overlooked when rolling out the new MOOC offerings to vast audiences (the word “sunami” was often used in describing the effect of the MOOC movement on HE education worldwide). It’s that second voice that makes me personally excited about the DUT decision to aim at having at least 50% of our programmes with an online component by the start of the 2015 academic year. Receive an email notification of new posts.